As a collaborative culture, Navelencia Middle School will commit to high expectations in order to promote academic achievement and the development of responsible citizens through rigorous educational opportunities and experiences. Kings Canyon Unified School District Fair. Kings Canyon Unified School District will host the annual District Fair on Tuesday, October 16 from 5:00 to 7:30 p.m. at T.L. Reed School. School sites and district departments will host a variety of booths including information, games, and food for sale. Various performance groups from throughout the district will provide entertainment. 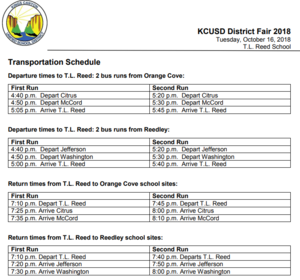 Transportation to the event will be provided from various locations in Orange Cove and Reedley.” Click on the link above for transportation locations and schedule. Back to School Night will be on September 6th from 5pm to 6:30pm. School Starts Wed. Aug. 15th, 2018 8am to 1:26pm. If students have not turned in their registration packet please turn them in on Monday Aug.13th or Tuesday Aug. 14th from 8am to 2:30. Spring recess will be from March 26th-April 2nd. EL students will be taking the ELPAC Test starting March 5th and ending on March 9th. This years Science Olympiad will take place on March 3rd, 2018 at Clovis North High School. The event is scheduled from 8:30am to 5:30pm. Come support Navelencia as they compete against other Fresno County Middle Schools.